I wrote this post more than a week ago, but it was somehow unpublished. I’m sure it was operator error. My apologies for leaving you folks in suspense. 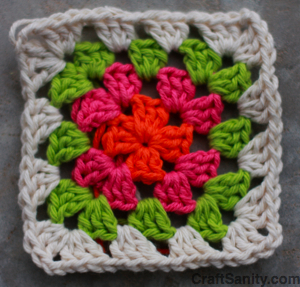 The Granny square madness continues. Here’s today’s square, the second in a blanket series. And now for those giveaway winners…. Kathy of Loveland, Colorado and Janis of Salinas, California and Teresa of Lakebay, Washington each won copies of “Made From Scratch: Discovering the Pleasures of a Handmade Life” by Jenna Woginrich. Also, I need to announce the winner of the portable craft contest that fell between the cracks. I wrote a craft column a while back asking for portable craft ideas. Steph, you were randomly selected the winner of “Weekend Sewing” by Heather Ross. In other winner announcements Fern of Comstock Park, Michigan and Wendy of Bowie, Maryland each won my Grand Rapids Press giveaway for copies of “Hop to It!” by Edyta Sitar. Congrats, ladies! You all should have received an e-mail message letting you know that you won. Please reply with your snail mail address and we’ll ship out those goodies.